Fats come in different categories ranging from “good” to “better” to the “really bad for you” levels. Fitting into that range of good for you, but not the best are the polyunsaturated fats. The only types better are unsaturated and monounsaturated fats. A good way to know what type of fat is in a food that isn’t labeled is to look at it at room temperature. If it is in liquid form at room temperature it is better for you – with whole milk being an exception to this rule. If it is a solid, such as most saturated and trans fats found in butter and margarine, then it is not as good at controlling cholesterol. Polyunsaturated fats help control cholesterol by lowering the low density lipoprotein (LDL) cholesterol which is the bad form, and also by raising the high density lipoprotein (HDL) which is considered to be the good cholesterol. Most polyunsaturated fats come from corn, soybeans, and fish. You can also get it from safflower and cottonseed oils. The unsaturated fats, polyunsaturated fats and monounsaturated fats all pretty much come from plants, nuts, and seeds. When these types of fats are consumed, especially in place of foods high in trans fats and other types of simple carbohydrates there is a positive effect on blood cholesterol. The right combination of foods containing specific vitamins and minerals is extremely instrumental in controlling cholesterol. 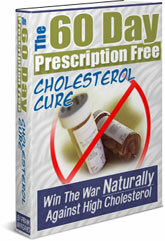 To find out more about how you can raise HDL and lower LDL cholesterol through good food choices, and without prescription drugs, read The 60-Day Prescription Free Cholesterol Cure.